It’s a new school year and we have a new rule in our house. This rule has to do with treats in lunch boxes. Although my children have been in some kind of school since they were three years old, I am relatively new to the whole packing-a-lunch thing. The preschool that Spencer goes to, which is the same one that Graham attended, serves the kids a hot lunch every day. So in preschool days, I only pack a lunch when there is a field trip. Packing a lunch – having a lunchbox, getting to drink juice at lunch, my food instead of the school’s – is special for Spencer just as it was for Graham. I started a tradition in Graham’s first year of preschool – including a special treat in his lunchbox. That treat, when packed lunch was something that happened without regularity, was a chocolate kiss. Once Graham started kindergarten last fall, I wanted to keep up the treat tradition. As a child, I remember looking forward to lunch even in first grade, and I know my little foodie first grader is the same. For the first few months of kindergarten, I stuck with the chocolate kiss. Then, after Halloween, it was a piece of his Halloween candy. And then Valentine’s Day candy. And then Easter candy. And then whatever candy we had lying around the house. Now, I am fine with my kids eating candy. I ate candy as a kid and I turned out all right. But when I would offer him a homemade cookie as a treat and he chose some disgusting artificially flavored and colored thing instead, my feelings got hurt. Hence the new rule. 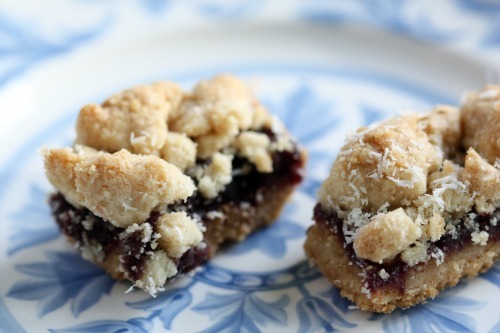 It is hereby declared that all treats in lunch boxes must be homemade. I will relent for a few weeks after Halloween because it is a BIG DEAL for my kids (most kids) but then it’s back to homemade. I know, for us adults being force to bring a homemade cookie is hardly a hardship but for a 6¾ year-old, it might take some getting used to. When Randy started his new job in January, I decided to send him in with treats every week. I was good for the first couple months and then as my classes started getting busier I just couldn’t fit it in. So it is now my hope that I can combine the lunchbox treat for Graham and the office treat for Randy and still have a few left over for Mommy. I have a lot of baking books. And yet, I can sometimes find making cookies uninspiring. I look at recipes and my thinking is, “yep, seen this all before”, so I resort to tried and true favorites. 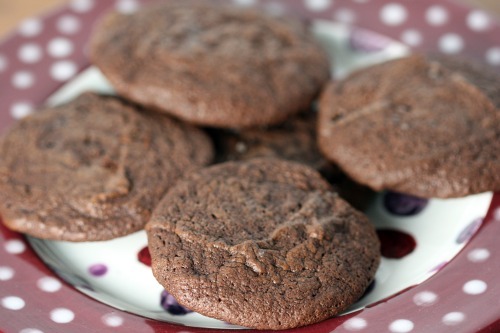 There is nothing wrong with those favorites but when I am feeling stuck, I often turn to Martha Stewart’s Cookies. These cookies could easily fall into the “look pretty but taste boring” category. But they don’t. Cashews play a role in one of my all-time favorite cookies and they are wonderful here as well. There are chunks throughout but you also purée some down with a bit of oil to make your own cashew butter. The chunks and the butter, combined with the caramel drizzle on top, make for an addictive cookie. These guys are sticky though. I made them small so that I would get a large yield and they kind of wanted to just all stick together in one massive cookie. I’m a little tired these days and finding a plastic container where I could lay them between layers of waxed paper seemed like a little too much effort. Hence, they went to work with Randy in a foil-wrapped cookie ball and they are sitting in my cookie jar en masse. You’ve been warned. Preheat oven to 350ºF. Sift together flour and salt. Coarsely chop 1 cup cashews; set aside. Process remaining 1½ cups cashews in a food processor until finely chopped. Pour in oil; process until creamy, about 2 minutes. Put cashew mixture, butter, and sugars in the bowl of an electric mixer fitted with the paddle attachment. Mix on medium speed until pale and fluffy, about 2 minutes. Mix in egg and vanilla. 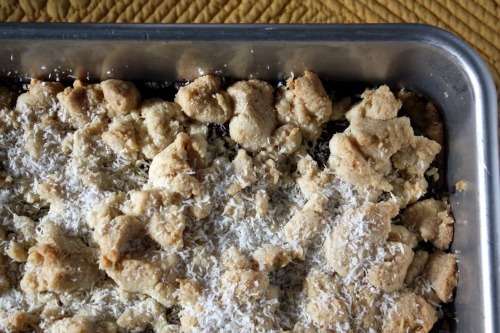 Reduce speed to low; gradually mix in flour mixture and reserved chopped cashews. Using a 1½-inch ice cream scoop, drop dough onto baking sheets lined with parchment paper, spacing 2 inches apart. 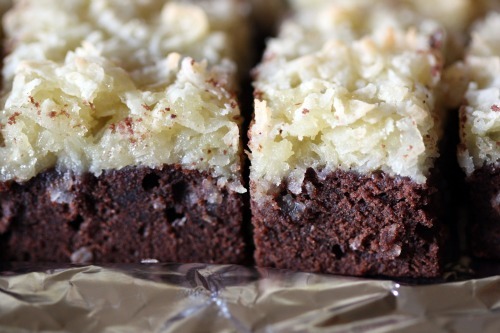 Bake 6 minutes; gently flatten cookies Bake until bottoms are golden, 6 to 7 minutes more. Let cool on sheets on wire racks. Melt caramels with cream in a saucepan over low heat, stirring. Let cool a bit. 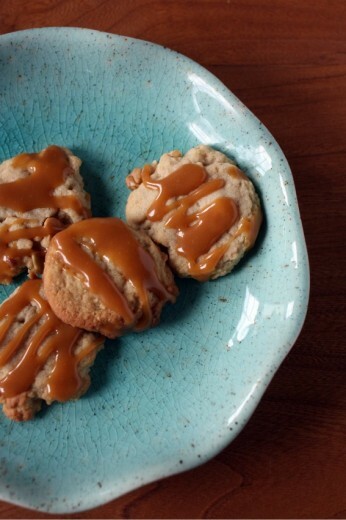 Using a spoon, drizzle caramel over cookies; let set. 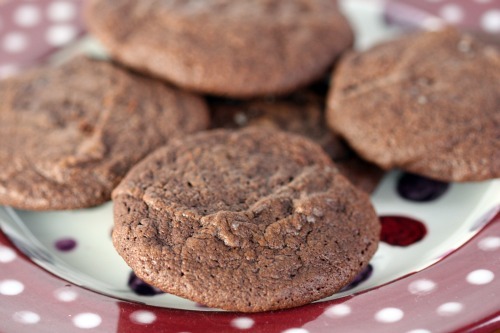 Cookies can be stored in airtight containers at room temperature in single layers up to 3 days. 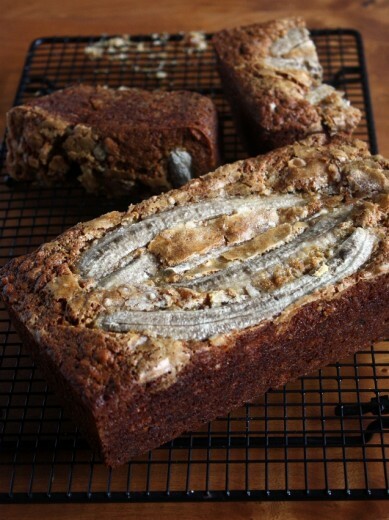 Periodically, I want to make banana bread. 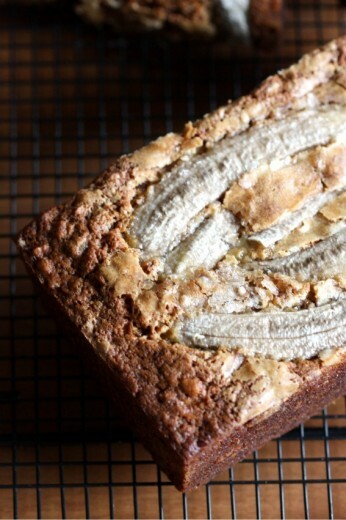 I can’t really explain why since I’m not even that fond of banana bread. Maybe it is the ease of preparation, the ingredients seemingly always on hand, the satisfying and great smelling loaf that comes out of your oven after so little effort. There is one problem with my desire to make banana bread. We never have any bananas. I buy bananas each week and my kids devour them. Spencer (4) has been known to eat three in a day. No matter how many I buy, they are eaten. We never get close to over-ripe bananas. I read about people who freeze bananas that are too brown to eat for future banana bread making days. All I have to say is, can I have some of your stash? Paging through Tartine, I came across this recipe. 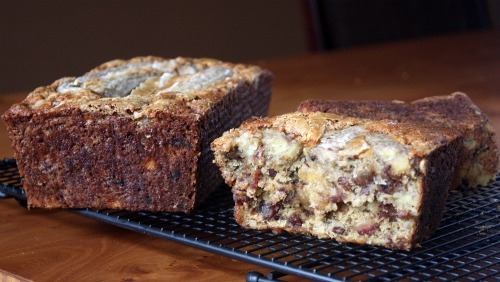 Instead of a banana bread, this is a banana tea cake, made different by the use of butter (rather than oil), and the addition of chopped dates. Immediately I glanced at my fruit basket. For some crazy reason, I had not one, not two, but eight ripe bananas. Meaning I could double the recipe and have two cakes. How did this happen? Clearly this recipe was meant to be made in my kitchen. I even had dates in the refrigerator from some catering last week. So, also periodically, I like to keep it real here. I have disasters in my kitchen. They usually involve cake. Cake that either decides to stay in a pan because of an insufficient grease job, or cake that seems like it is baked through, only to have the middle of it puddle out after being removed from the pan. I had a bit of both with one of these cakes. And here is where I will tell you that sometimes equipment does matter, and that paying a bit more is worth it. I have two 9×5 loaf pans. One is really old and one is brand new. The old one I bought in a grocery store years ago for about $7. The new one came to me from the King Arthur Flour web site and set me back $16.95. I baked my two loaves side by side in my oven, both were filled with the same amount of batter, and one turned out perfectly. The other gave me this for a middle. I will let you guess which was which. Here is my pretty cake with the two salvageable ends of the ugly cake behind it. Disasters do happen. Preheat the oven to 325ºF. Lightly butter the bottom and sides of a 9-by-5-inch loaf pan. This recipe is easily mixed by stand mixer fitted with the paddle attachment on medium speed or by hand with a wooden spoon. In a mixing bowl, combine the flour, cornstarch, cinnamon, baking powder, and baking soda and stir too mix. Set aside. Peel the bananas and place in a second bowl. Mash with a fork until you have a chunky purée. Add the eggs, vanilla, and salt to the bananas and stir to mix well. Set aside. In a third mixing bowl, beat the butter until light and creamy, about 2 minutes. Slowly add the sugar and beat until light in color and fluffy, about 2 minutes. Scrape down the side of the bowl with a rubber spatula. Slowly add the banana mixture and beat until incorporated. Again scrape down the sides of the bowl, and then mix for anther 30 seconds to make sure all the ingredients are incorporated. 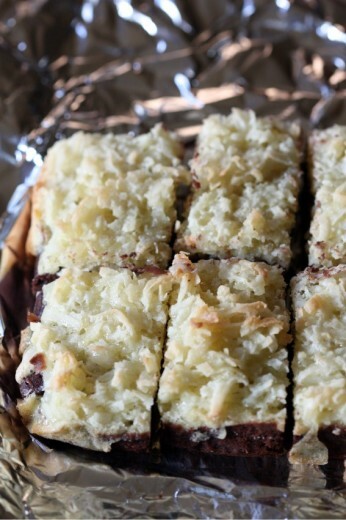 Using a rubber spatula, fold the dry ingredients into the banana mixture. Then fold in the nuts and dates. 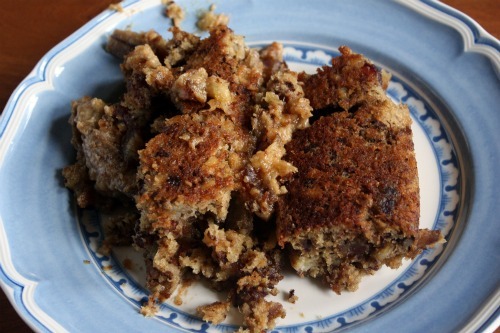 Scrape down the sides of the bowl and mix again, making sure all the ingredients are fully incorporated. Transfer the batter to the prepared loaf pan and smooth the surface with an offset spatula. To top the cake, peel the banana and cut in half lengthwise. Then place each half cut side down and cut in half lengthwise, to yield 4 long slices. (DT: I didn’t do this quite right.) Lay the slices on top of the batter. Sprinkle with sugar. Bake until a cake tester inserted in the center comes out clean, about 1 hour. Let cool in the pan on a wire rack for about 20 minutes, and then invert onto rack, turn right side up, and let cool completely. Serve the cake at room temperature. It will keep, well wrapped, at room temperature for 2 days or in the refrigerator for about 1 week.